Early 1970’s blaxploitation movies were very popular. Many of those movies contained beautiful music. 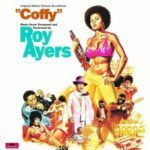 As was the case with Coffy, which got a fantastisc jazzy soundtrack, made by Roy Ayers.